The clubs’ coat of arms is a double-headed lion grasping the flags of the two parent clubs: the blue and white of the Corinthians and the chocolate and pink of the Casuals. ​The Coat of Arms was granted to the Corinthian-Casuals in 1959 by the College of Arms in recognition of the club’s services to football. No other club, amateur or professional had been so honoured. Charles Wreford-Brown, who captained both Corinthians and England, is credited with coining the name by which football is known world-wide. 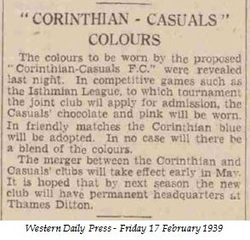 The team's distinctive home colours of Chocolate and Pink have endured for 130 years. They were reputedly the racing colours of one of Casuals' founder members in 1883, F. Bickley an Old Etonian. The club continues to wear the famous white and navy colours of Corinthians for away matches. Corinthians hold the record for the biggest defeat of the most famous club in the World. In 1904, Corinthians defeated Manchester Utd 11-3. ​In 2004, an anniversary re-match was played at King Georges arena where Manchester United exacted their revenge! Both Real Madrid and SC Corinthians Paulista chose to wear white shirts due to the influence of the Corinthians, who they considered to be the world's finest footballers at the time of their clubs' formation in 1905 and 1910. ​​It is often said that the colours England play in were also influenced by the Corinthians' white shirts and navy shorts, however England had already been wearing this combination for 10 years before Corinthians were established. 22 men were killed in action during the First World War who had played for Corinthians. It is estimated that a further 80 players and former members of The Casuals also lost their lives during the conflict. The club's records were lost during the war so the exact number remains unknown.